Cuban food has long endured a reputation as bland and unimaginative, but considering the country’s recent history, perhaps allowances can be made. The “special period” following the demise of the USSR – Cuba’s main trading partner – and the US embargo, caused imports of oil, fertiliser and basic food staples to plummet, bringing the country dangerously close to famine. For a long time the state was primarily concerned with keeping mouths fed – fine dining doesn’t feature highly in communist economics. Interestingly, that period of extreme hardship led to a blossoming of sustainable agriculture in Cuba as people turned to low oil and organic production, resulting in the emergence of organopónicos – organic urban gardens created by local communities to keep themselves fed. These gardens are still tended today and you can see them in Havana and other cities. Now that the worst is behind them the Cubans are busy catching up with the rest of the world and culinary standards are rising fast. Large state-run restaurants, even in Havana, may still feel uninspired compared to elsewhere, but the country’s paladares (private family-run restaurants) are an absolute treat. Step out of your hotel, find a good paladar and dig into Cuban culinary culture. Cuban food is not hot or spicy but, when done well, it’s delicious. The staple of most meals is black beans and rice, usually accompanied by pork or beef shreddings (called ropa vieja) and chicharritas or tostones (plaintain fritters). Other traditional dishes include tamales (the Cuban version is made from corn with a pork filling and served in corn leaves), yuca con mojo and congrís (a drier version of black beans and rice where it’s all cooked together). When it comes to desserts try casquitos de guayaba (sweetened and cooked guava peelings or shells served with cream cheese), flan de calabaza (pumpkin flan), and dulce de leche (thick, very sweet, evaporated milk). Cuba produces some incredible chocolate, with cocoa beans grown in the microclimates of Baracoa (px). Baracoa chocolate has a flavour like no other. Buy a Guamá bar or two to take home and enjoy handmade chocolate delicacies at the Museo del Chocolate in Old Havana. While the food may have lacked imagination, the country more than made up for it with the drink. Cuba produces some of the world’s finest rum. 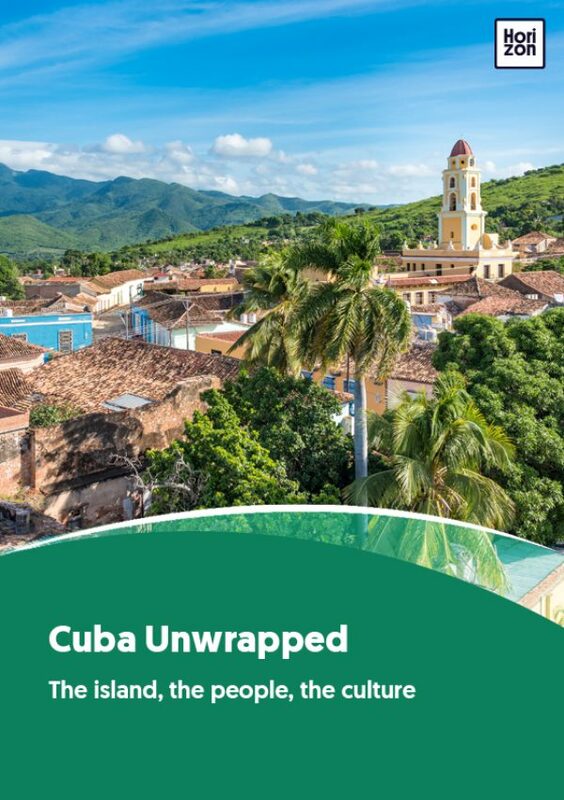 The country was home to the Bacardi family (which fled to the US after the revolution) and also to national brands Ron Caney, Ron Santiago, Ron Varadero and, of course, the prestigious Havana Club. Note that under the new rules affecting US travellers, visitors are now allowed to bring home rum, tobacco and other Cuban products – provided they’re for personal use only. Naturally all that rum was put to good use, and Cuba is the home of the mojito and daiquirí cocktails which were invented in the Havana bars La Bodeguita del Medio and El Floridita respectively. Both were frequented by Ernest Hemingway and you can follow in his footsteps today (although you’ll find a far better mojito elsewhere).